The Beechjet 400, an updated version of the Mitsubishi Diamond II Bizjet, features new engines and a new and larger interior. 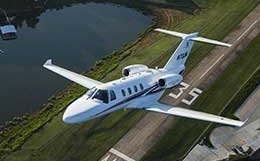 With a cabin stretching over 15 feet, the Beechjet 400 is equipped to comfortably transport six passengers, maintaining a large baggage capacity and a full lavatory. The Mitsubishi Heavy Industries Corporation began research into the demand for a small business jet in 1969. Based on the result from this study, Mitsubishi began the development of the MU-300 Diamond in the mid-1970s. The MU-300 Diamond would be a light twin engine private business jet designed to compete with the latest Cessna and Learjet models. In August of 1978, the Diamond I made its first flight. After a drawn out Federal Aviation Administration (FAA) certification process, the model received FAA certification in November of 1981. Four years later, the next iteration in the Diamond line was released as the Diamond II. This model featured upgraded engines for increased performance specifications. However, shortly after production began, the Diamond rights were transferred to Raytheon/Beech, who renamed the model the Beechjet 400. 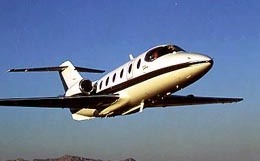 Production on the Beechjet 400 started in 1982 and ended in 1985. 70 aircraft have been built so far. The cabin of this private business jet is typically set with a four-place club seat with a side divan. 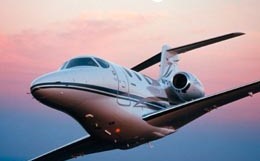 The Beechjet 400 is typically configured to seat seven passengers, but can be arranged to accommodate a maximum of nine. 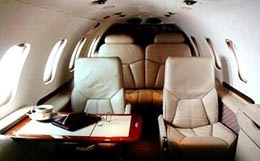 The cabin of the Beechjet 400 measures 15.6 feet in length, reaches 4.8 feet in height and stretches 4.9 feet in width. Due to its design, the Beechjet 400 features a full-width aft lavatory that features some baggage space in addition to a rear baggage compartment that is not accessible in flight. With a maximum cabin pressure differential of 9.1 psi, the Beechjet 400 is capable of maintaining a sea level cabin altitude at an altitude of 24,400 feet. The Beechjet 400 comes equipped with two Pratt and Whitney Canada JT15D-4D turbofan engines. Each engine is rated at 2,500 pounds of thrust at takeoff. The Beechjet 400 requires 3,940 feet of runway to take off at sea level on a standard day. At an airport with an elevation of 5,000 feet, this takeoff requirement increases to 7,500 feet of runway. With four passengers, the Beechjet 400 needs only 2,600 feet of runway to land. This private business jet features a maximum certificated service ceiling of 41,000 feet and an all engine service ceiling of 39,000 feet. 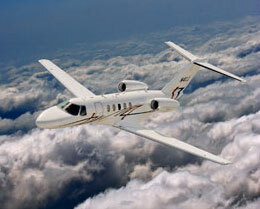 The Beechjet 400 also features a maximum range of 1,142 nautical miles. For a flight to a further destination, the Beechjet 400 is capable of maintaining an airspeed of 375 knots at an altitude of 39,000 feet in a long range cruise configuration. To reach your destination in a more timely manner, the Beechjet 400 is capable of maintaining an airspeed of 422 knots at an altitude of 35,000 feet in a high-speed cruise configuration. The instrumentation typically found in the avionics suite selected for the Beechjet 400 may include a Primus 300SL color weather radar, distance measuring equipment (DME), dual TDR 90 transponders, SPZ 900 autopilot, dual Collins VHF 20A comms and dual VIR 30A navs, automatic direction finder (ADF), and a Sperry APZ 500 flight director. For more information about chartering, leasing or buying a Beechjet 400 please contact us by calling +44-20-3874-8091 or send us an email here.